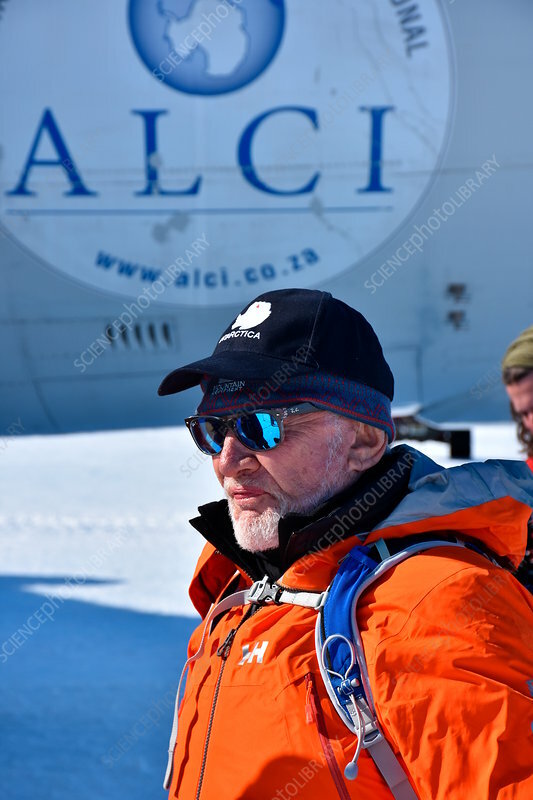 Buzz Aldrin in Antarctica. Retired US astronaut, and second man on the Moon, Buzz Aldrin alighting from an Antarctic Logistics Centre International (ALCI) plane after landing at Novolazarevskaya Station, Queen Maud Land, Antarctica during his journey to the South Pole. Aldrin was the lunar module pilot for the Apollo 11 mission (the spaceflight that landed the first two humans on the Moon) and was the second person to walk on the lunar surface, doing so on 21st July 1969 with Neil Armstrong. At the age of 86, he is the oldest person to reach the South Pole (as of 2017). Photographed in November 2016.